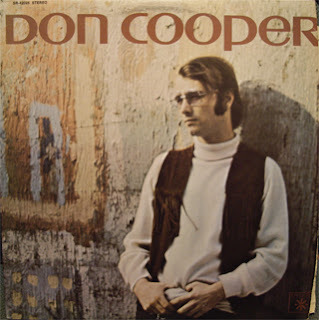 After a long, unintentioned break, VT is back to present you the two first records by obscure folk-pop singer Don Cooper. Don Cooper was a promising folk-style singer/songwriter who enjoyed some modest success -- mostly on-stage -- during the early '70s. Coming up as he did amid the singer/songwriter boom of the era -- dominated by the likes of James Taylor, Carole King, Joni Mitchell, Leonard Cohen, and Loudon Wainwright III -- he got lost in the shuffle, perhaps because he was signed to a label (Roulette) that was positioned badly, in terms of image and distribution, to break an artist working in his particular genre. Born in the mid-'40s, he grew up in various locales, his father's work taking the family to numerous towns across the country throughout his childhood. Cooper began playing the ukulele (which was a big instrument among kids in the 1950s) in elementary school and was drawn to country music as he grew older. In high school during the early '60s, he played in various bands, with a repertory heavy on the work of James Brown, Buddy Holly, and the Beach Boys, all done country-style. The transforming moment of his life came when he first heard The Freewheelin' Bob Dylan, the 1963 album that established Dylan as a major songwriter and artist. By that time, Cooper was playing a regular gig at a local coffeehouse and began mixing his music and Dylan's songs. By the end of the '60s, at just about the same time that James Taylor and Joni Mitchell were poised to emerge as major artists, Cooper found interest in his work from three different labels, and ended up going with Roulette Records, a company that was primarily associated with jazz (Count Basie, et al.) and pop/rock (Tommy James & the Shondells, et al. ), founded and run by a totally disreputable figure named Morris Levy. In early 1970, just weeks after signing a contract, his self-titled debut album was released. Cooper proved himself strong singer, with a rich and powerful voice, and also a serious and dauntingly talented songwriter on this and on his subsequent three Roulette albums, which he produced himself. He was good enough to rate support spots on-stage with the likes of Blood, Sweat & Tears (in their peak years) and Chicago at major venues, including Carnegie Hall. He was, thus, able to reach thousands of people at a time at some of his bigger support gigs. What he wasn't getting, however, were major record sales -- not that Roulette was putting much into marketing his albums, either. Put simply, he was probably the right artist at the wrong label. Apart from its unique jazz roster of the late '50s and early '60s (a point when Levy, with deep pockets and personally being a big jazz enthusiast, was able to pick up a lot of artists being dropped or overlooked by the major labels), Roulette's big strength had always been at breaking big singles, mostly by virtue of Levy's mob connections and his "unique" access to the jukebox business. 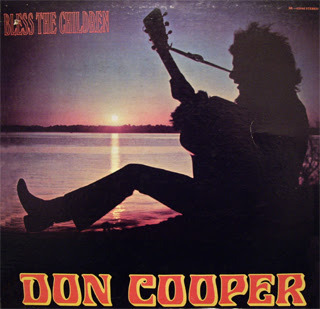 But the music industry was different by the 1970s, and on top of that, Don Cooper wasn't aiming at listeners who did much with jukeboxes -- he was recording songs that were going to get placed in or played on a lot of them (at least, not outside of a few college-town pizzarias). In short, he wasn't Tommy James and wasn't writing "Mony Mony," much less recording it. On Reprise or Columbia, he'd have had a good shot, but Roulette wasn't really the place for an artist like him, anymore than it would have been for Leonard Cohen or Livingston Taylor. All songs composed by Don Cooper unless noted otherwise. The third and fourth albums may end up appearing here as well. So stick around! Do you have anything by Tom Yates? VT is back! And how! I have not heard any Don Cooper previously so thank you for allowing me the priviledge this time around. thanks for all your efforts. I'm looking forward to interviewing Don on my radio show called Radio Base Camp this Friday , Jan. 2 .09. It will be broadcast on WPKN 89.5 FM in Bridgeport, CT and 88.7 FM WPKM in Montauk, NY. Cooper is a very cool singer-songwriter who deserves more attention. 1st saw Don Cooper in '69 at an upstate NY college - must have seen him 4 - 5 times in the yrs I was there. He did get a little airplay on Long Island in the 70's, but no where enough for him to reach an audience. I own all 4 albums, but they are pretty tired by now. Popcat, thanks for the 1st 2 albums, have you shared either of the later 2? I shared the fourth album as well. Check the blog. I just downloaded the Don Cooper album, and when I tried to extract the file, it asks for a passphrase. Anyone know how to get that to open the files? Thanks. I heard Don play on many occasions at SUC at Cortland, NY sometime during 1969-1972. He was a fabulous singer/songwriter. My girlfriend Joanie then bought the albums, and now I'm so sorry I didn't. ........ Does anyone know the name of the song with lyrics, "welcome home, sweet sister of gloomy times hmm hmm hmm hm hmm ... and those dreams of salty ladies, drift away in dreams of lonely blue ... blues ain't a song you sing it how I live each day ... " something like that. I'd love to get a recording of that song. @Dana - there's a song on "The Ballad of C.P. Jones" (the only album not posted on VT) that's titled "Lonely Blue," that sounds like a good candidate. I had the vinyl back when it was current and (sadly) lost it. I spent a lot of time in the pre-internet days looking for a replacement to no avail and just recently came across an allegedly 'new' copy that I received today. I haven't opened it yet, but it certainly looks pristine. I can hardly wait to hear what it sounds like after all this time. Many, many thanks to popcat for posting the other albums and rekindling my interest! There's also a compilation of 15 of DC's songs on a 2005 CD titled "Howlin' at the Moon." The production quality is less than wonderful, but it is 'listenable,' and I feel like buying it sort of casts a vote for resurrecting some of this great old stuff. UNO PERCIBE LA CALIDAD CUANDO UNO ESCUCHA A DON COOPER , ES COMO NATURAL .